As a child, we had a beautiful old weeping willow tree in our side yard. My friends and I spent many a day under that old tree sharing secrets and playing games. much that beautiful tree saw and heard. Fondly, I’ll never forget the sound of the wind whispering through that willow tree. The weeping willow tree is one of the first signs of spring in my state. Lovely words. I enjoyed it. 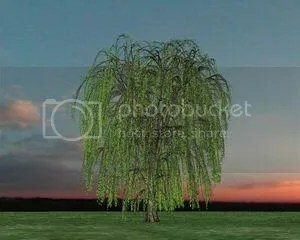 I too had a weeping willow tree in my side yard in Canada. I LOVED that tree. I remember playing under it, I remember finding these blue bugs that looked like lady bugs. And I remember the inch worms and these little tiny caterpillars, maybe some type of silk worm…hanging from the leaves. My dad eventually cut the tree down…why, I dont know. I will have to ask him why they did that. Amy, my Dad cut ours down too and to this day, I still miss that old tree!Piggy…did you bump your head when you were 4 and recover when you were 30? I didn\’t know Pigs even lived that long??? How long do pigs live? I am going to call my dad right now! There was one in my neighbourhood. lt was at a doctor\’s office, not a private home, so it was fair game. We swung off it\’s branches many times! l also remember quiet moments inside the branches. Ah, summer. . .
You know, I\’ve always liked those but we\’ve never had one growing in our yard. Many of them around here seem to have trouble and don\’t live very long so maybe it\’s for the best but I do like the ones I see. They always remind me of happy times gone by and of course summer. This is Just Beautiful Rhonda. Thank you for this one. I just spent a few hours running and walking through my Big Maple trees in the back of the Farm here. We had so much fun. Three injured . All of us . One scaped knee and I and the smallest may each have a black eye. Too funny. Im worn out. And I carry Coby somethime. He is big boy for just about being 2. again Beautiful entry. Thanks for stopping on my Door Step. Have a Wonderful Night. PS .. Today I was reminded that meomories are to be made and kept deep within. This just helped me keep more. The willow tree poem is spectacular, when babies smell of jazz!!! What amazing lines! Butter soft porches. Thank you for post of Ms. Lohr\’s poem. Do not know her as a poet so will look up and see what else. But what a rich poem to discover and savor on a Sunday afternoon. Thank you.